This is old school survival horror with bullets and weaponry always seeming to be at a minimum. The areas are non linear with you needing to solve simple, yet fun puzzles, as well as finding specific items and keys to open up new places. Starting off at the police station you eventually get to a few other areas, though the station is roughly half the game. 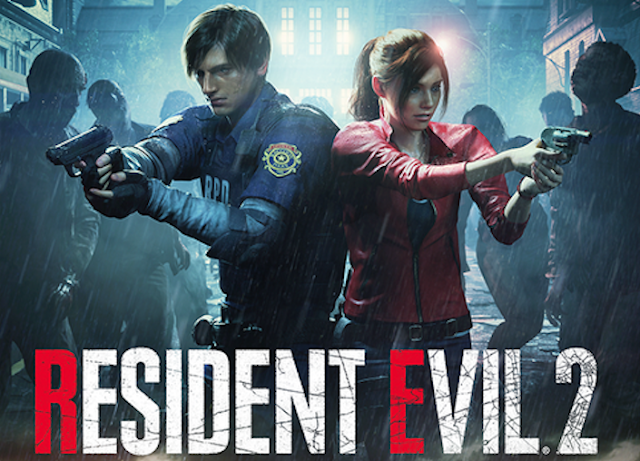 This looks fantastic, the graphics are great, I had so much joy seeing how improved everything was. This also applies to the character models, the expressive facial details never ceased to fill me with joy. Those expecting a straight remake should be pleased to discover that the game has a completely different layout than what was there before. Occasionally you will get to a room or corridor and realise it is the same, that was always fun to spot. These changes also apply to the characters you meet, people such as Chief Irons and Robert Kendo appear in different places to what you would expect, as do enemies, such as the iconic first appearance of the licker enemy now being somewhere else entirely. The game is no longer fixed camera angles, instead it is over the shoulder third person which gives you much better control over your shooting. 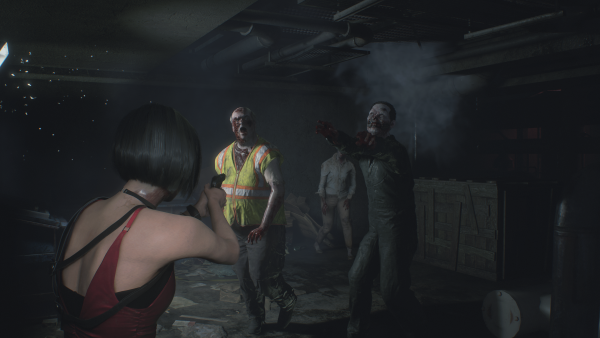 This is best shown with the sublime zombies, now you are able to shoot off individual limbs. The A.I for these enemies is a lot of fun, unless you destroy the head itself these ghouls have the ability to spring back to life no matter how many bullets you have sunk into them. Lickers are also fun to fight, they seem far more dangerous and surprised me on more than one occasion with how quickly they can leap around.. Zombie dogs though for whatever reason have a bark worse than their bite, not only are they weak but they didn't even manage to attack me successfully on either of my two playthroughs. Later on the plant enemies you encounter have had a real big change to them, I won't spoil it but I approved of their change. For all these neat enemies though some have sadly been removed entirely. Zombie crows, giant spiders, the giant moth - all just don't figure here at all which I was disappointed to discover. A big change is the Mr. X Tyrant. In the original game he only appeared in the B mission, here he turns up in both campaigns, hounding you through various locations. It is here where again I had a slight issue, there are certain rooms in the game where enemies just will not follow you. This isn't just the expected safe rooms (so called for a reason) but also various other rooms, meaning often I didn't feel the threat I should do as I knew I could game these chases to my advantage. This now leads me to my biggest complaint, that of the A and B campaigns. In the original game the B mission felt like a real change. Not only did you approach areas from different locations and had items switched up, but you also had different puzzles and bosses. Claire for instance had to collect three stone tablets to escape the station, while Leon had to find four chess plugs to be able to get away. Now both characters always need the exact same items to progress through the game. The bosses were also unique for each campaign, William Birkin was a constant battle for both characters, yet the two would fight different mutations of him in different locations. Now for both campaigns the characters not only fight the exact same mutations of Birkin, but they also fight him in the exact same locations, defeating him in the exact same way. I just felt this was so lazy, and made the idea that these two campaigns are meant to be taking place at the exact same time feel unbelievable. I don't know why they decided to homogenise these to play out the same. The plot though is much more well told this time around. The voice acting is actually good, coupled with the more detailed character models and you have a lot more interesting characters. Characters are all fleshed out, such as the psychotic Chief Irons, Marvin the hapless cop you meet, and the relationship between young Sherry and her parents. It was all wonderful stuff, and this time you even get reasons provided for why you are heading to the places you go to, as well as slightly changed situations (such as Ben the reporter in the original having purposefully locked himself in jail, while here it is Chief Irons who has locked him up). On that point I was saddened to say one of the four main areas from the original is simply gone in this remake. Some weapons are also gone, such as the bow gun, and the grenade rounds for the grenade launcher. I can't say I was too sad to see either of those vanish, they are replaced anyway, the totally useless spark shot that seems incapable of killing anything, and a minigun which of course was a great weapon. A complaint about the story itself is that all the good cutscenes no longer take place. The fantastic flashback to how the G-Virus was released is nowhere to be seen, the scene showing the helicopter crashing into the station is gone, it seemed that every great cutscene was culled from this remake, no idea why at all! 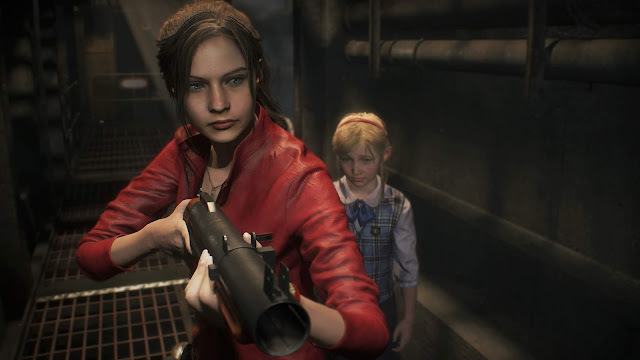 While Resident Evil 2 can be completed in around four to five hours there is a crazy amount of replay value. As well as the A and B missions you can also play them the other way around leading to four playthroughs. Getting an S rank unlocks secrets, as do hunting down collectibles, as well as completing specific challenges to unlock artwork and character models. 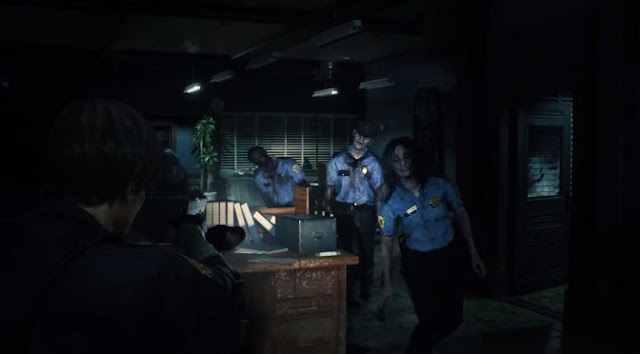 The 4th Survivor mode also returns, tasking you as soldier Hunk who has to make it to the roof of the police station from the sewers to escape. Of course in tandem with that should you escape them you can also try it as the iconic Tofu (a literal giant block of tofu!). As if that wasn't enough in February there is going to be the release of three separate mini stories each focusing on a different character - the mayor's daughter, Robert Kendo, and an Umbrella soldier. 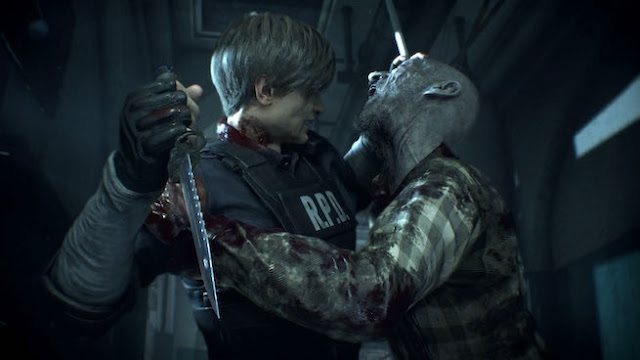 While I had a lot of issues with Resident Evil 2 Remake it is still a game I loved. It was frustrating to see where they seemingly cut corners - the removal of cutscenes, the limited amount of zombie models, the reduction in enemy types, making the B campaign less unique, all of these grated on me, yet I still had an absolute blast playing this. This doesn't make the original obsolete, but does make that story more accessible for a modern day player.